The Poultney/Mettawee Basin includes the land surrounding the South Lake up to Split Rock Mountain, Lake George, the shoreline area of Addison County, and the drainage areas of the Poultney and Mettawee Rivers. Watershed and river groups in this Basin include the Poultney-Mettowee Watershed Partnership and the Lake George Association and Lake George Watershed Conference as well as the Poultney-Mettowee NRCD, Lake St. Catherine Association and Lake Bomoseen Association. Want to learn more about the Poultney/Mettowee River Watershed? Our Fall 2013 Watershed Educators have researched each sub-basin in the Lake Champlain Watershed to create a power point presentations as a resource for you. We've made each presentation available here, on our watershed pages, so that you can present it to classroom, show it at an informal talk, or use it to learn more yourself! 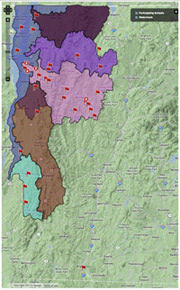 Click here to view the Poultney/Mettowee River Watershed presentation.